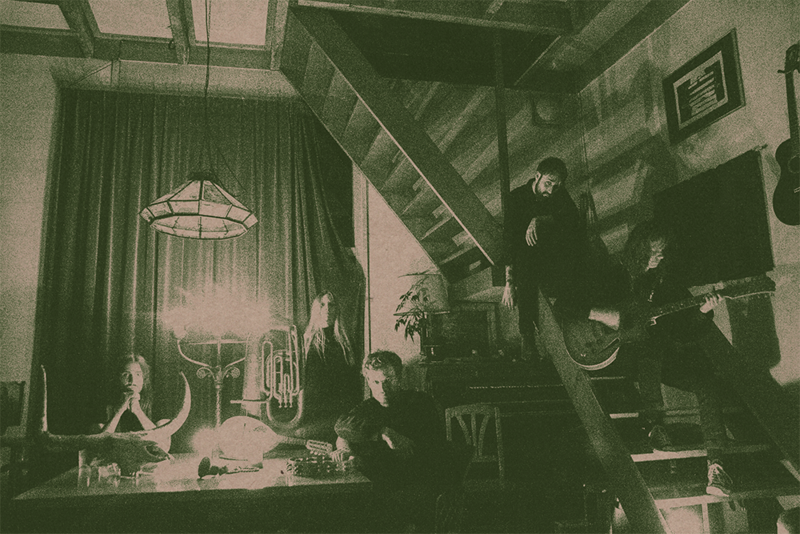 Nusquama deliver some excellently produced Dutch black metal, with a nice wedge of three-dimensional emotional content. Horizon Ontheemt floats proudly in the blackgaze/black metal suburbs. In this regard, it’s about as pure a creation as one could hope for. To fire out a few contrasting descriptions, the album is tight, raw, noisy and clean. If you know how a well-produced black metal album should sound, then you’ll understand where I’m coming from. Understand also, that from within Nusquama‘s purist conventions, one may feel a strange sense of musical enlightenment. And it’s nothing to be alarmed by. It’s just part of the ebb and flow of how post-rock-gazey-blackness has evolved in this day and age. From the opening track, “De Aarde Dorst”, the high-end riffage hovers on the fence of positive and negative emotion, and it’s hard to tell which avenue of the spectrum it intends to commit to. As it turns out, it’s sort of melodic, kind of nice in fact. The key changes in the following moments add something a little more sinister, but on the whole, it’s strange how profoundly pleasant the music turns out to be. Guiding it along its quest in epic juxtapose fashion are the vocals, decidedly abstract in their lyrical content, but providing an appropriate veil of torment to Nusaquama‘s music. The style is fairly consistent, and free floating in its positioning in each song. Keep your ears peeled for those key moments where these vocals come in at such a high pitch, it’s effectively unsettling. These are the concrete foundations on which the album develops. With each passing track, it meditates on the formula with a sense of faithfulness, and adds various new layers to keep the ears well fed. The slower, eerier qualities of third track “Vuurslag” are a good example of this, where the midway interlude subscribes to the same wrought emotion in just a few clean guitar plucks, and culminates in a fairly triumphant finale to hint at just a pinch of the progressive. This structure operates solidly for the middle act of the album, as a similar formula can be found in the following song, “Eufrozeyne”. But as I already stated, its core elements are what the record ultimately draws from, feeling so comfortable in its skin that it sees no reason to wonder too far astray. “Horizon Ontheemt” finishes as it begins. The thunderous percussive blasts, the tireless and rich distortion, the vocals presenting themselves as an effective background siren, carry the emotion right towards the final note. And when listeners are done, they’ll know that substance and depth guided them along their journey. Nusquama give a nice demonstration of what it means to be black metal in the modern era. Though it’s not a conventional per se, it draws strongly from the necessary hallmarks and delivers a passionate and emotionally distinct product. It doesn’t cut corners, and it certainly doesn’t conserve energy. It’s one big discharge of raw thought that, ultimately for all its rage, seems to look towards the light rather than the dark.